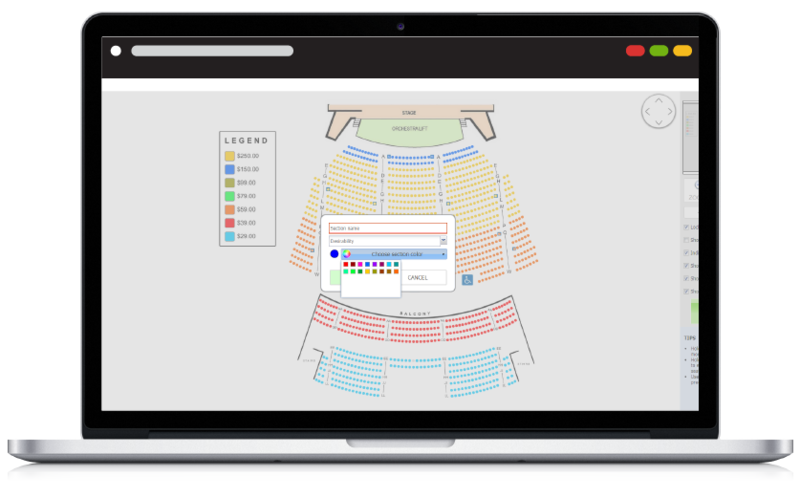 Our powerful assigned seating system gives your guests the ability to load an interactive seating map, see the exact layout the venue, and choose their own seats. Our maps are built to be true-to-form with all the curves, rows, isles, and everything shown true to scale. Additional images and graphics can be added such as legends, logos, sponsors…anything you can think of. Although you have control to build and manage your own maps, we know you are busy would rather do more important things like promoting your events. So send us your map and we will build out your venue map quickly and for free. For venues up to 10,000 seats, we can usually have the map built and ready to go within 24 hours. Visually indicate the pricing and sections of seats by color coding the seats on the map. 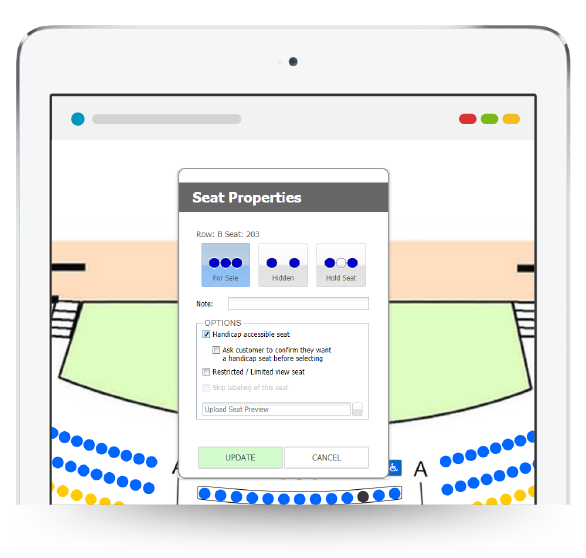 This makes it very easy for your guests to get a bird’s eye view of what the price of the seats are and decide which ones they want to purchase. 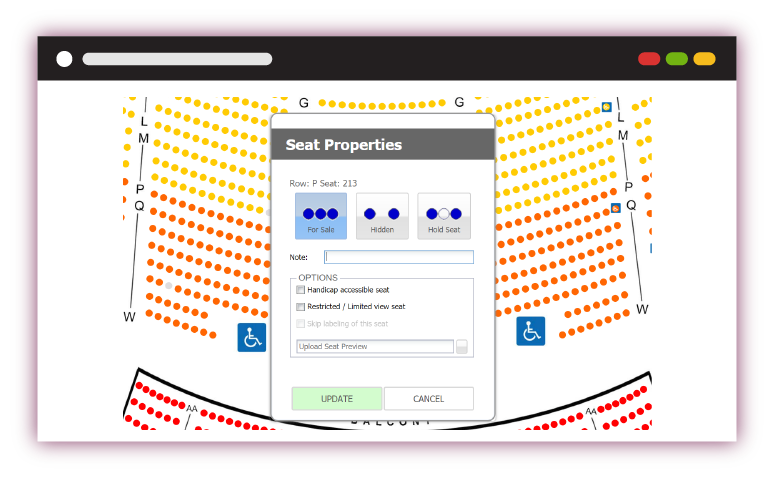 You can choose between showing color-coded circles or actual images of seats to represent each seat. 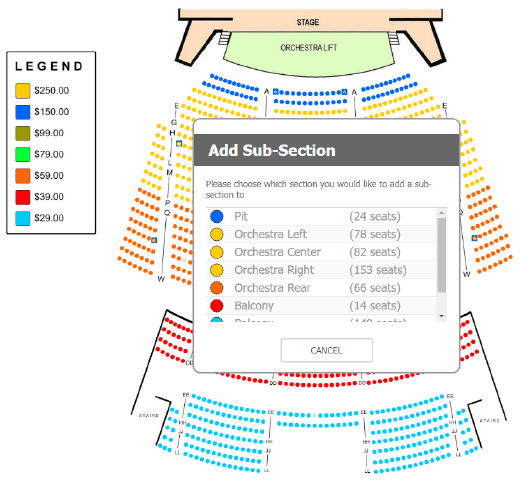 If you choose color-coded circles, when a seat is available for sale, it will be the color of the section. If the seat is sold, it will be grayed out. 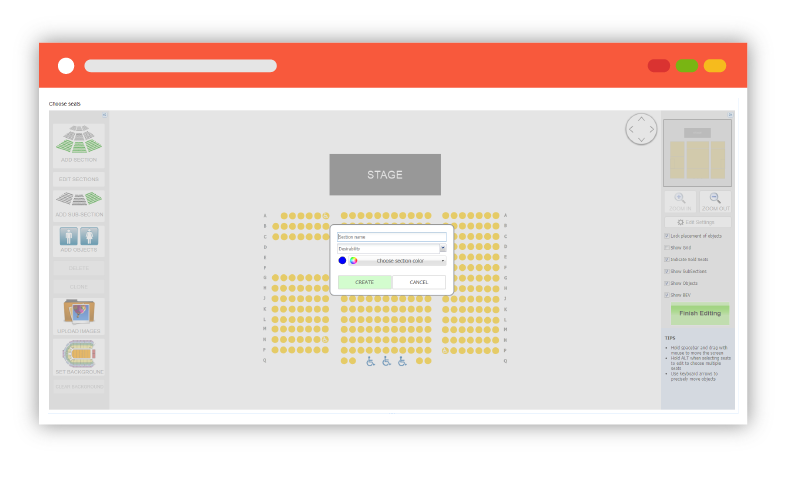 If you choose to have actual images of a seat shown instead of the circles, it will show empty seats if the seat is available for sale and if it’s sold or unavailable, it will show a person in the seat. 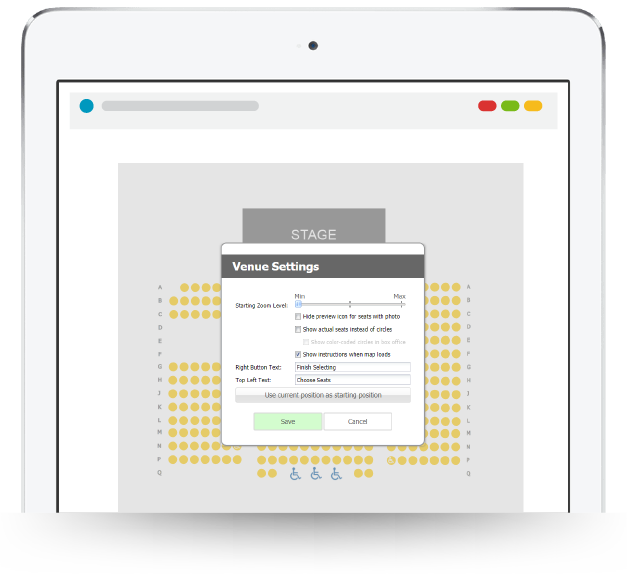 This gives you a lot of control over how your event’s seating map looks and feels. 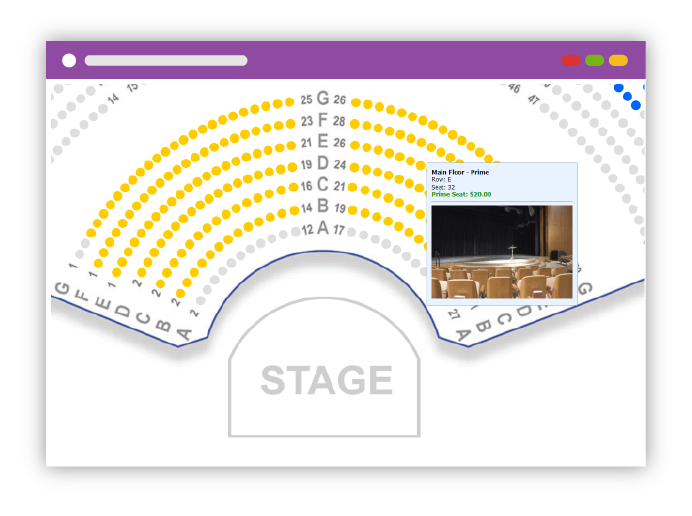 You can upload photos of the stage from the seats so guests can really see what it will look like from the seat they are looking at. Clearly indicate which seats are reserved for handicap seating. In addition to showing a wheelchair icon over the seat, you can also add alerts and confirmations to guests to ensure they realize a given seat may be handicap or even that it’s a wheel chair space. 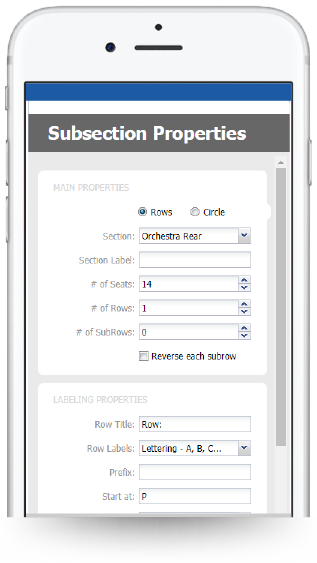 Add custom notes on seats to pass on valuable information to the customers. If a seat is on hold, available only at the box office, or even if the seat is reserved for sale through an outlet, you can identify all of this so guests have all the facts in front of them when deciding which seats they want. You can add as many images and graphics as you like to your seating mpa. This can include a legend, your logo, sponsors, or icons indicating the location of the bar and coat check. 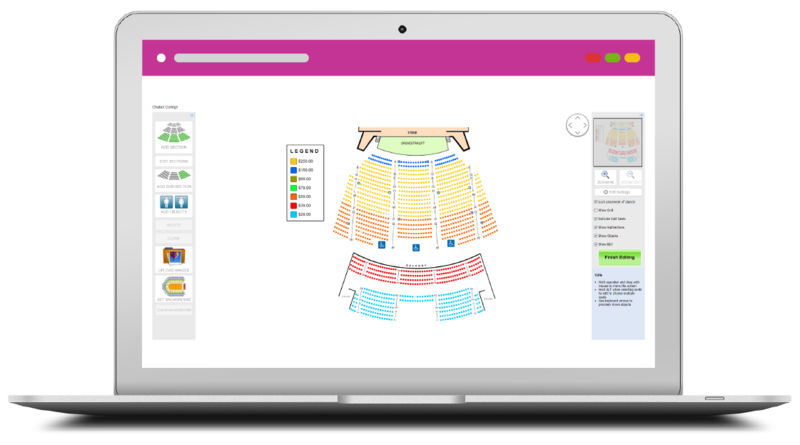 You have full control over how beautiful your seating map is! 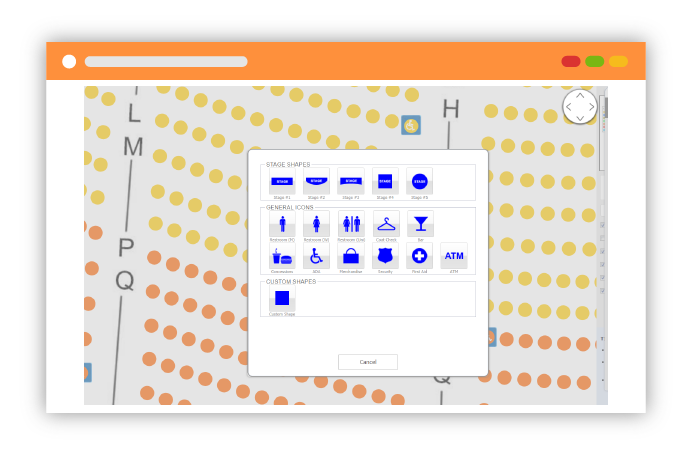 We have several built-in icons that can be easily added to your seating map to indicate the location of the bathroom, bar, coat check, merchandise booth, security, first aid, ATM, concessions, and so on. If you have a large venue, a Bird’s eye view overlay can be added to give a high-level visualization of the pricing of the sections. 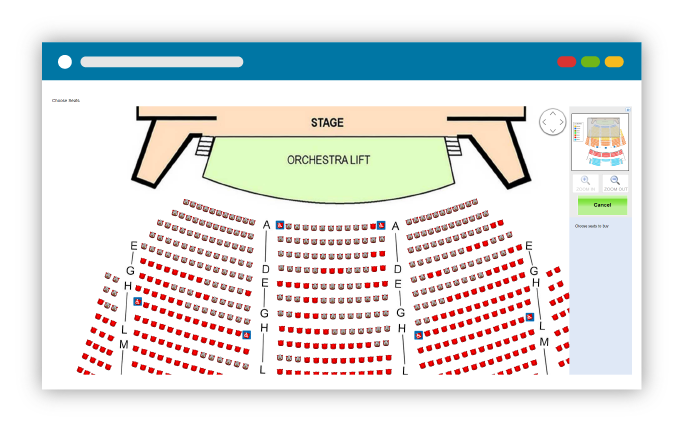 This way guests can look at the whole venue in one easy view, decide which seats they want based on pricing, then click on the section to zoom in automatically so they can pick the exact seat they want. Support for tables, rows, booths, etc. Our seating system allows for huge flexibility. 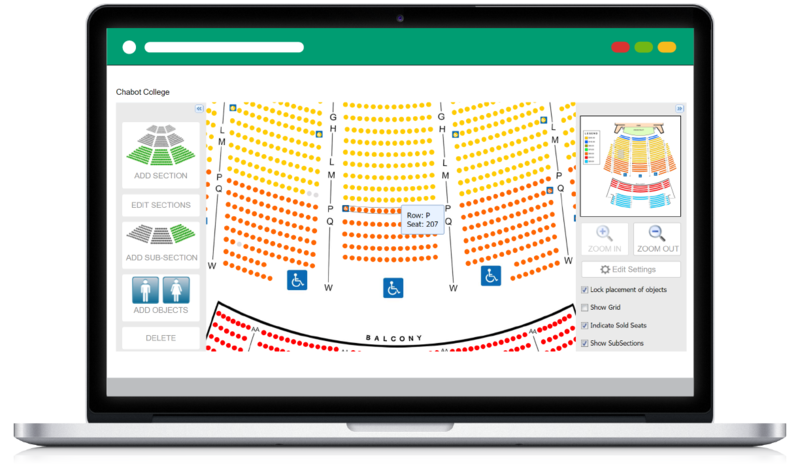 Whether you are selling seats in rows, seats at a table, whole tables, selling booths for your vendors, or a combination of all of them, they are all supported and easily shown on your seating map. 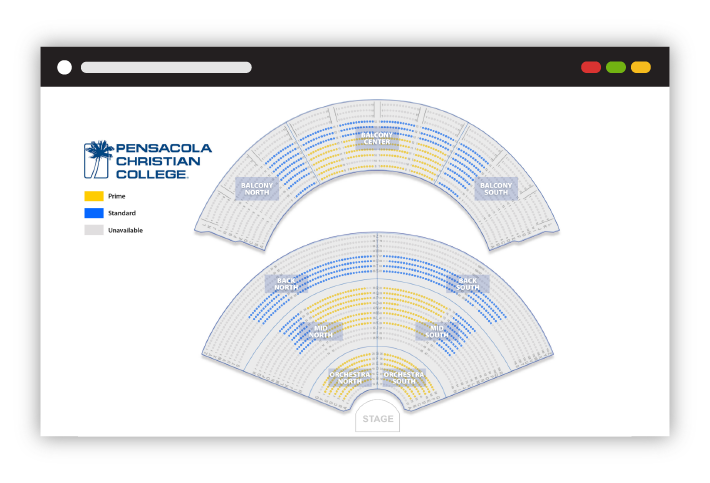 Seating maps are fully mobile optimized for smartphones and tablets. 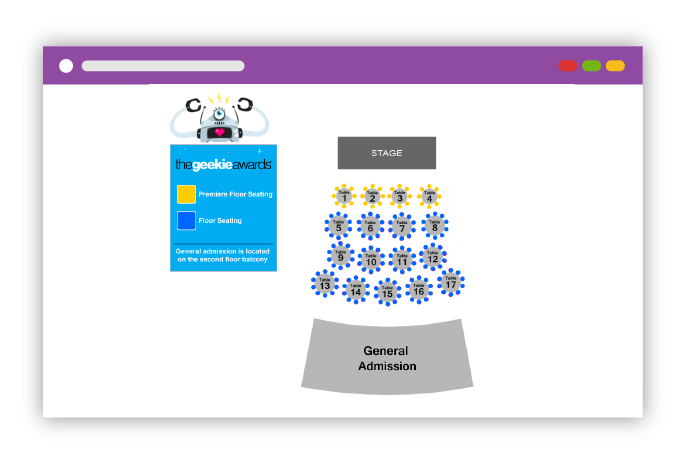 With so many sales occurring while mobile on smartphones and tablets, it’s critical that your guests can purchase tickets just as quickly and easily on their phone as they can on their desktop computer.